I have recently taken on a new role at YIS…In-School Professional Development Leader. More to come on what this means, but it’s really thinking about how we support teacher learning while at ELC to grade 12, whether in meetings, PD days, or through the Professional Growth Plan. I’m both excited and overwhelmed with the possibilities. This post is about the first initiative with this new role. Our school, on the somewhat isolated country of Japan, value learning from each other. We also believe in punching above our weight. These are powerful qualities to have in a school. 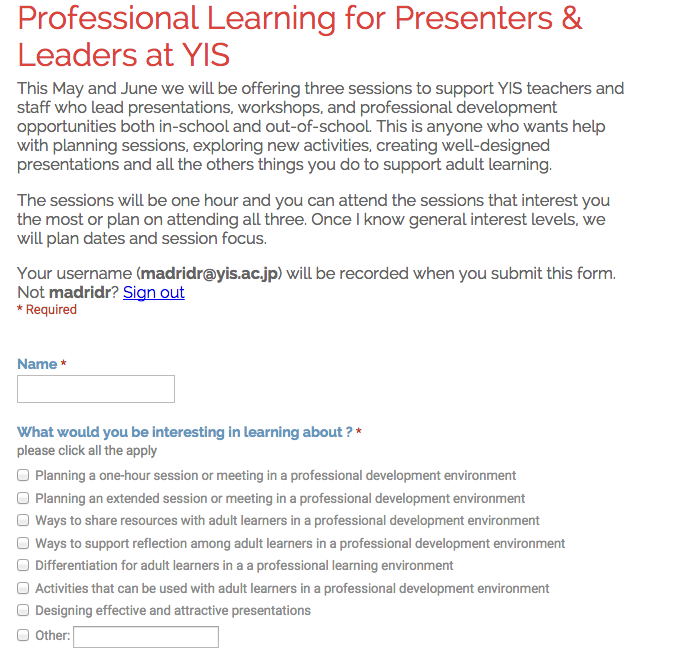 Around 20% of YIS teachers have led a professional development session of some kind outside of school. For a small school, this is a pretty impressive number. And even more teachers have lead workshops at school. With this is mind, in my new role of in-school professional development leader, was to organize a learning opportunities for teachers who lead PD sessions, at school or away. I wanted to take advantage of the expertise we had of experienced presenters. We have the amazing Kim Cofino, who presents around the world, at our disposal and I wanted to steal ideas from her. And we had design-teacher extraordinaire, Joe Martinez, who does gorgeous presentations. And, equally important, I wanted to help empower other people so that they felt confident in presenting to other adults in a professional setting. Again, I can’t stress enough how small our school is. And at the end of the school year, to see so many people, some of them unexpected, willing spend time thinking about professional development was pretty impressive. Based on the feedback, we ended up having three voluntary sessions, open to all staff. I sent a pre-survey to the people who said they wanted to go to help out Joe and Kim and they did amazing things. Session 1: May 27th (4-5PM): Designing an attractive and effective presentation. Run by Joe Martinez, this session will look at tools, templates and styles that will allow you to create attractive and effective presentations. For this one, I wanted to give people options other than Presentation Zen. We, as a staff, are pretty good at using images instead of bullet points. I love Presentation Zen, but Joe’s style suggests there might be a next level. As simple as adding lines or pushing Google Presentation to the max, it’s amazing what we can do. Session 2: June 1 (11-12PM): Creating an one hour workshop: This session will focus on how to plan for a one hour session with adult learners run by Kim Cofino. Kim will address how to create a plan, how to engage learners with with different activities, how to tap into prior knowledge, share ideas/resources and reflect. This session really broke down Kim’s thinking about how to structure, plan and engage adult learners. Practical things like grouping and different protocols for collaborating. No one knows this stuff better than Kim*. We were beyond lucky to have her as a friend and colleague and this session was just one more example of that. Session 3: June 11 (4PM-5PM) –Creating an extended session created by Kim Cofino: This session will look at how you plan and organize an extended session for adult learners. This session will address engagement of adult learners (before, during and after), storing/organization/sharing of your PD resources, supporting reflection, and differentiation for adult learners. Have I mentioned no one knows this better than Kim? The first session had almost thirty people show up. The second session (held on a day with no students) had about 25 people. And the third session, definitely a more niche topic, had about 12 people. It was amazing to see a room with teachers from all different parts of the school, including almost all the administration team, sit down and talk about adult learning. I wish I took pictures, but I was too busy learning. It’s pretty meta having a PD session about how to run PD. Kim’s fantastic sessions, in particular, focused on how to run a meeting, by using strategies she uses to run a meeting or learning session. It was a bit trippy. And all three sessions were excellent. I’m not sure of the impact of these sessions yet. I want to do more and I think people want more. We want our teachers to be leaders both at YIS and beyond, because they have so much to share. And I do know that the Head of School ran a end of year meeting using some of the ideas for Kim and Joe’s session. And that can’t be a bad thing. * In many ways, the inspiration of this session was to take full advantage of the last days of Kim at YIS.